This is just a quick post about one of the breakfasts I made for myself this past week. I had made a local steak for dinner earlier in the week, so I cut it into strips and sauteed them with red onions in some olive oil and butter. I added a splash of red wine vinegar at the very end to complement the red onions and to add a bit of a tang. 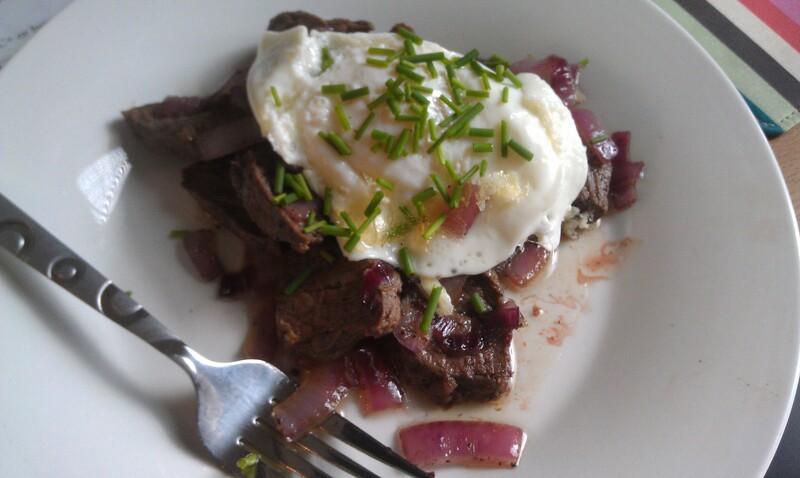 I fried an local, pastured egg just as the steak and onions were finishing. I topped the whole dish with some chopped chives for a green accent and a bit more onion-y flavor. When I cut into the egg, the bright orange yoke dripped down and combined with the vinegar and oil on the steak to make a delicious sauce. It was so delicious and filling! This looks wonderful. The last time we had steak and eggs for breakfast was on vacation in Las Vegas. I never think to do that with steak leftover from the night before. Then again, we never have steak leftover!